1. Works on most vehicles (OBD II andamp; CAN)-domestic and import. 13. Multilingual menu and DTC definitions- English, Spanish, French, Germany, Italian , Russian. Caution: Please keep the igntion off before you connect ANY test equipment. WIDE VEHICLE COMPATIBILITY --- Works on most vehicles sold in the USA with model year of 1996 or newer; EU 12V petrol after 2002. EU 12V diesel after 2004. Asia 12V cars after 2009.Supports all OBDII/EOBD protocols: KWP2000, ISO9141, J1850 VPW, J1850 PWM and CAN (Controller Area Network); Works with English, Spanish, French, Germany, Italian , Russian. Just plug play. TURN CHECK ENGINE LIGHT OFF --- Quickly read and clear stored emission-related codes, pending codes and show code definitions. Turns off the MIL (check engine light), help in resetting the monitor before taking it to Smog, it tells you what is going on before bringing the car in for repair, avoid you the trips to your mechanic. 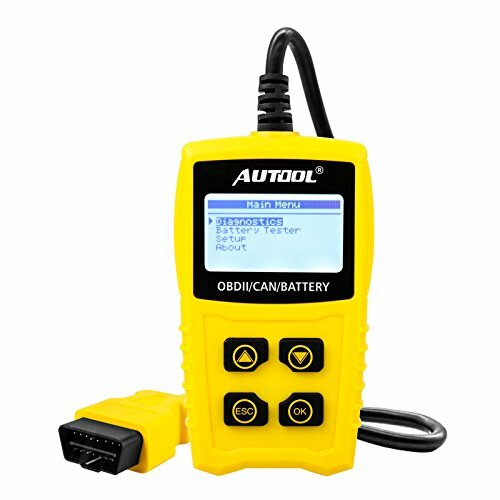 ABUNTDANT OBDII DIAGNOSTICS --- Supports Read Codes, Erase Codes, Real-time Live Data including values(volts, rpm, speed, etc) and system status(open loop,fuelsystem status, etc), View freeze frame, I/M readiness, and Vehicle information recognition. BATTERY VOLTAGE METER --- Compared to traditional code reader, AUTOOL CS330 allows you to capture the automative battery voltage and keep you informed if any battery problem occurs, 128*64 pixel backlit display give you clear result and easy viewing. EASY APPLICATION --- No battery needed, Connect it with the OBD interface and play. Even a beginner can use this easily. We provide one year warranty, if any question please feel free to inquiry, we will handle it at our earliest.